Click here for all the latest NAMM 2011 news in one place. 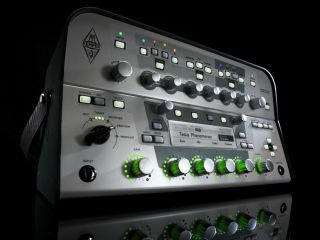 NAMM 2011 PRESS RELEASE: Kemper GmbH have announced the new Kemper Profiling Amplifier to be unveiled at the NAMM 2011 show in Los Angeles. The Kemper Profiling Amplifier is an entirely new concept for guitar amplification in the digital domain. Following the radical idea that every guitar player should be able to bring his personal sound of the tube amp setup he owns into a versatile, comfortable and most important reproducible format: The Kemper Profiling Amplifier 'learns' the sonic behavior of any guitar amplifier and offers exactly the tone and feel the player knows from his 'real' amp. The times of struggling to 're-find' that magic mic position in front of the speaker are over. Now there will be a profile available of basically any sonic condition the tube amp setup can provide. Of course not every guitar player owns a perfect studio environment or owns a number of classic tube amps. That is why the Kemper Profiling Amplifier comes stacked full with profiles of classic tube amps: the British, the Californish, the Germish… of course including the classic speaker cabinets which are a part of the profiling result. The Kemper Profiling Amplifier comes as an extremely handsome lunchbox size device with all the professional connections for home, studio and on stage use. It is completed with a stomp box section, a master FX section and a set of unique, before impossible parameters for shaping the amp profiles further from classic architecture to modern. Of course a realistic power amp sagging which is normally only available at very high volume is also 'a part of the stack'. Come to NAMM 2011 - to get proof! This all may sound unbelievable, but it works. Kemper GmbH will prove this at NAMM. They indeed take it to 11, so to say! At booth #6900 in Hall A Kemper GmbH will have a ready to go profiling setup installed, consisting of a very versatile high class tube amplifier with various classic tube amp architectures, connected to an isolation cab with a celestion vintage 30 speaker that is miked up with the standard SM 57. The guitar is connected to the tube amp via the Kemper Profiling Amplifier and the mic signal goes back into the mic input of the Profiling Amplifier. By the hit of a single button the profiling process starts and after 10- 20 seconds the guitar player can compare the profiled sound with the sound of the real tube amp. That's it. Simple as that! Amazing! The retail price for the Kemper Profiling Amplifier is not defined yet, availability is expected to be 'N.A.M.M.' - Not available maybe May.